This is part 3 of 3 from SuperGrover and his most excellent review of each team's performances in the Premier League so far and his expactation for the remainder of the season. This article covers the 8 teams left in the bottom half of the table. Thanks to SuperGrover for his excellent analysis as always! Enjoy. Fulham started as one of the surprise attacking teams in the league, with new transfer Dmitiar Berbatov propelling an offense that averaged 2.2 goals the first 11 games. Since then, the wheels have completely come off, with Fulham averaging just 0.8 goals over the second half of the campaign. Looking at the underlying numbers only adds fuel to the fire. 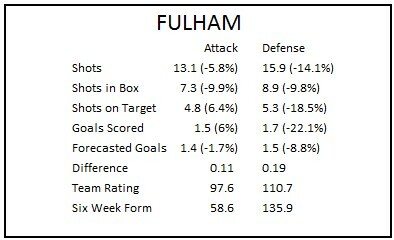 Fulham’s six week form is awful, worst in the league in attack and 2nd worst in defense. Injuries have played a part, but how much of one remains to be seen. Fun Fact: In the first 12 weeks, Fulham average 9.2 shots in the box. Since then, they have averaged only 5. Prediction: Jol struggles to find offensive identity all season. The Berbatov honeymoon ends as his work rate becomes a real problem while Fulham fights relegation. In the end, they manage to stave off relegation but aren’t completely comfortable until game week 37. Very interesting club. 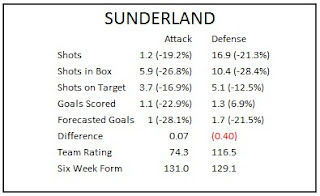 Sunderland started out very defensive minded, producing shots at levels not commensurate with the goals being scored (they averaged just 1.6 shots on target the 10 weeks but managed to score 7 goals during that time). Since then, the attack has improved tremendously, with the six week form rating the Black Cats as the 5th best attack in the league! It does appear that opening up the attack has left their defense somewhat weakened. Over those same ten weeks, goals allowed have increased 50% while other defensive metrics have shown similar increases. Nonetheless, the new attacking prowess has been an overall positive as Sunderland is simply better than they were before. Fun Fact: Steven Fletcher scored 5 goals on his first 5 shots on target this season. He has scored 3 in his last 13. Prediction: Martin O’Neil's tactical changes results in more goals on both sides, but allows Sunderland to remain in the premier league another season. I have to admit, I enjoy Rickie Lambert. He’s not the most gifted player and will never be more than he is, but he understands the game and he understands how to score. I have been rooting for the Saints and Lambert ever since locking onto the striker as a preseason budget option. I couldn’t be more pleased with the results. It was presumed that Southampton started the season poorly, but much of that was due to a difficult run of fixtures that saw defeats to Man City, Man United, Arsenal and Everton in the first 6 games. Since then, Southampton are 4-7-5, accumulating 20 points in just 16 weeks. Interestingly, the underlying statistics indicated they weren’t as bad as thought all along. Further, the introduction of Jack Cork in week 11 seemed to correspond to a change in tactics. The defense was much more organized and the attack more cautious, taking chances when available but not stringing out to do so. Luke Shaw’s emergence and a more settled central pairing also helped. 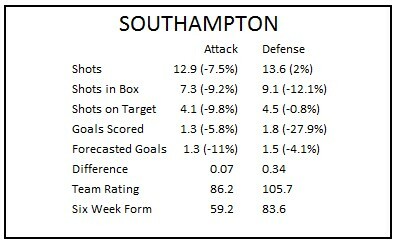 The results can be seen in the six week form that shows the Saints as a poor attack but stingy defensively. Fun Fact: Rickie Lambert has created the 2nd most chances among all forwards with 45. Prediction: The recent form is no fluke and the Saints stay clear of relegation. Rickie Lambert scores 15 goals and Luke Shaw is hailed as the next Garreth Bale. Demba Ba was excellent, but injuries hit the Toon hard in the first half of the season, especially on the backline. The result is a desperate attempt to stave of relegation, something that seemed highly unlikely for this talented but flawed club. The underlying statistics tell the story here. 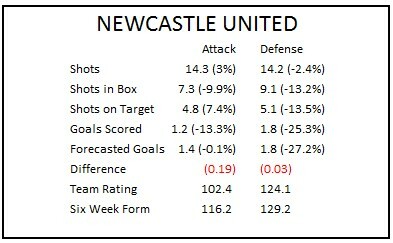 Defensively, Newcastle are terrible, one of the worst two defenses in the league (by some margin). 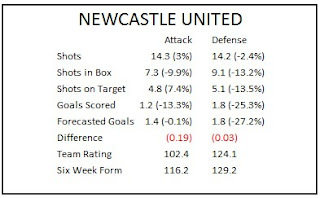 Offensively, Newcastle take far too many shots outside the box, resulting in low conversion rates for shots on target. Given the absence of Ba, it’s difficult to see how this will improve. Fun Fact: Newcastle’s midfielders have taken 118 shots, but only 34 in the box. By comparison, Liverpool’s mids have 164 but 83 in the box. Prediction: Newcastle improve somewhat as injuries subside, but problems remain. The relegation fight goes until the very last few games of the season with a goal here or there being the difference. Wigan are unique among the Premier League as they are the only squad to regularly employ a backline of three. The uniqueness is interesting, but hasn’t resulted in much success on the pitch. 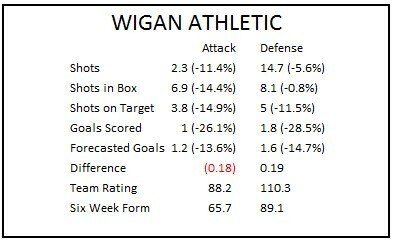 Wigan have been below average both offensively and defensively, ranking 10th and 15th, respectively. With that said, Wigan’s shot numbers look a bit better than their actual results, with both the attack and defence performing much worse than expected. That along with a favorable schedule down the stretch suggests that improvement may very well be possible for the Latics. Fun Fact: Wigan have just two goals from outside the box all season, tied for lowest in the league. Prediction: The fixtures ease up a bit, but Wigan’s record improves little. A clear relegation candidate heading into the last fortnight of the season. Aston Villa are not a good team. The results on the field have been poor and the underlying statistics not much better. They have struggled to generate and stop shots and the resulting goals conceded should be expected. The caveat is that Villa’s goal differential is an aberration to some extent. While they have been poor, they haven’t been 6 goals worse than everyone else. Further, unlike some other bottom dwellers they have registered a few points against some of the better teams in the league, winning at Anfield, drawing with Arsenal and taking 4 points from their meetings with Swansea. Nonetheless, this is a bad team that needs to improve quickly or face relegation. Fun Fact: Christian Benteke has scored or assisted on 76.9% of all Villa’s goals this season, easily the highest of all players with at least 1000 minutes played. 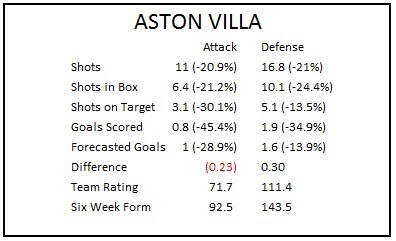 Prediction: Benteke continues to dominate, but Villa don’t have enough to back him up. Without a turn around, Villa get demoted. 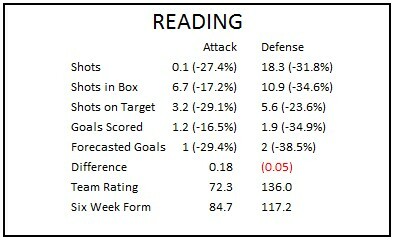 Reading are the worst team in the league and it’s not all that close. Offensively, Reading have been among a group of poor offensive teams at the bottom of the table, scoring occasionally but never generating an consistent attack. Defensively, Reading are atrocious, allowing more shots, shots in the box, shots on target, and goals than any other team in the league. They have been poor, and lucky to have the points they do. This is a team with little upside and little chance of finishing out of the relegation zone. Fun Fact: Pavel Pogrebnyak has scored on 27.8% of all shots, 7% better than Mr. Van Persie himself. Unfortunately, the Russian has just 18 shots all season. Prediction: Reading’s fate is sealed before the month of May. Harry’s next big thing still reside at the bottom of the table 5 points away from safety. It seems assured the Rangers will be demoted, right? Not so fast. QPR weren’t the worst team in the league when Redknapp took over and they certainly aren’t now. Their underlying numbers suggest they should have about 8 more goals on the season while allowing about 3 fewer. Now, one should look at the numbers above and immediately note a problem in their attack, namely Adel Taarabt. Taarabt is an unquestionably talented player, but one who far too often settles for shots well outside the penalty area. By himself, he has made QPR a team that relies upon low precision shots outside the box as evidenced by the shots in the box numbers above. That has to change going forward. On the other side of the ball, QPR have actually been pretty solid, especially under Redknapp, who has decided to park the bus against better competition the last couple weeks, securing 4 unexpected points in the process. 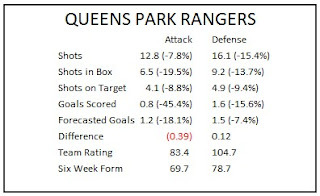 Even before that QPR showed defensive potential with much of the negative goal differential driven by an opening day 5-0 defeat in which they actually allowed just 6 shots on goal. QPR currently rank 12th in the total ratings. While that may be inflated for reasons listed above, there’s no reason to count this team as automatic relegation candidate. They can fight their way out of the cellar. 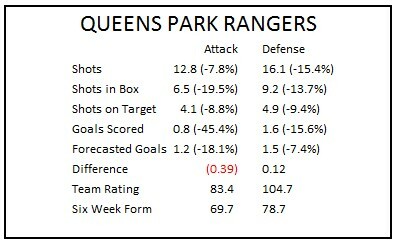 Fun Fact: QPR score a goal around every 16.5 shots. Manchester United score a goal every 6.2. Prediction: QPR bring in enough talent to present a legitimate attacking threat though the rest of the season. Taarabt settles down and Harry leads the team to a 17th place finish and another year in the premier league.